Rural, beautiful, in the heart of Tuscany located renovated (June 2014) holiday home on first and second floor. Part of a former olive farm in a panoramic position with a beautiful view over the valley with Volterra in the distance. Chianni, about 2.5 km away, is a beautiful village with, among other things, village shops and restaurants. 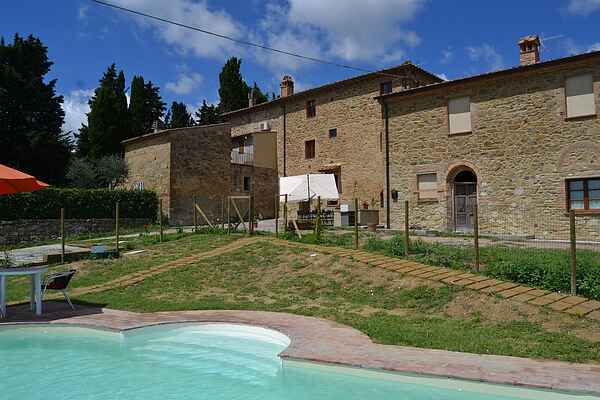 The house has been renovated in the old Tuscan style, with modern amenities and a communal fenced salt water pool. You share this pool with two other apartments. In front of the house there is a nice porch with a large table, bbq and parasols. Ideally located for lovers of hiking and mountain biking. From the house you can walk through the hills with vineyards and olive groves. Ideal base for trips to the coast of Cecina, to Florence, Volterra, Siena. Location 45 minutes from Pisa Airport. This house is comfortable for young and old. It has two bedrooms and two bathrooms, one with a bath. Bed sofa in the living room. Children can play outside to their heart's content. The house is in the heart of Tuscany, so cities like Florence, Siena, Volterra are easily accessible for a day trips. The sea is about 45 minutes away, as also the airport of Pisa. House Codes IT-56034-30, IT-56034-40 and IT-56034-49 are right next to each other and use the pool together. So for several families traveling together it's ideal.